Hey kids! Today, we’re going to be talking about one of the greatest inventors who’s ever lived: Thomas Edison. You may already know about some of his big inventions – our modern lightbulbs, video cameras, microphones, and speakers all come from things that he invented over 100 years ago! Coming up with all these inventions wasn’t always easy for Thomas, but he had one skill that really set him apart: he was very inventive! That means that he was really creative, and able to solve problems in clever ways. 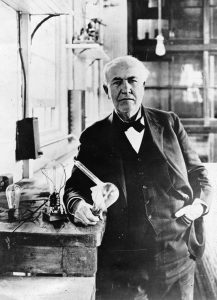 As you learn about Thomas Edison, think about times when you’ve been inventive. How Much Do You Know About Thomas Edison? a) One of Thomas Edison’s teachers called him “the brightest student” they had ever taught. b) Thomas Edison almost always worked by himself. c) After his first major invention, Thomas Edison never had a failed project. d) Thomas Edison is credited with over 1,000 inventions. Answer a is incorrect! Thomas actually only had one formal teacher, and that teacher called him “difficult,” not “bright.” Thomas had a hard time learning in a classroom, and he was only in school for 12 weeks – that’s about as long as one summer vacation! Answer b is also incorrect! Actually, a lot of Thomas’s success came from working with other people. Even though Thomas was the person coming up with all the big ideas, he needed a big team of smart, hard-working people to help him build and test his ideas. In fact, many people say that Thomas’s most important innovation was applying large-scale teamwork to the process of invention! Answer c is incorrect too! His very first invention, an electronic vote recorder, was a commercial failure – talk about a rough start! Even after Thomas had been a successful inventor for many years, he still had some failed inventions. The correct answer is d! After a lifetime of working as an inventor, Thomas had 1,093 patents for his inventions in the United States and a total of 2,332 around the world. That’s a lot of inventions! Learning is a life-long process. Whether Thomas was in school, reading books, working on new inventions, or just living his everyday life, he was always learning new things! It’s important to work well with other people. Even though Thomas was a brilliant inventor, he knew that he couldn’t accomplish his goals on his own. He was successful because he knew how to work with a team. We shouldn’t let our failures stop us from trying our best. Thomas had plenty of failed inventions and things that didn’t go as planned. Still, he never gave up on his work as an inventor, and it really paid off in the long run! At the end of his life, Thomas had a huge number of inventions to his name. He got to watch as things that he created made the world a better place. Even after he death, Thomas’s ideas and inventions have continued to improve the world! There’s a bit of magic in all of us! Thomas’s magic was invention. What’s yours?